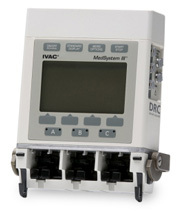 Save up to 80% on pre-owned Alaris/Cardinal Ivac Medsystem III infusion pumps. A fully charged battery has a minimum of 6 hours running time with all channels running at 125 milliliter per hour and backlighting usage of 2 minutes per hour. The main battery retains 80% of its capacity after 500 charging Cycles, and retains 90% of its capacity after 3 months of Continuous AC charging.